All plausible. I can only say what I would like to see. Hopefully another Ant Man film for a trilogy--and I also hope to see Ant Man in Infinity War II. I would really like a good, solid Iron Man movie that captures the spirit of the first one. IM2 and IM3 were terrible and I don't wish to see him sail off into the sunset in the sequal to Infinity War as you predict. I don't think SJ has the appeal with this genre such that Black Widow could carry a solo film but I would watch it. My kiddo likes seeing her and complains when females aren't adequately represented in any sort of films. Well Ant-Man is in the next Avengers, so you will get your wish there. There's also a possibility that there could be an Iron Man IV. i think RDJ mentioned a couple years back there was one in development, but that may have changed. I imagine he would get a HUGE paycheck to do another, which may preclude it from happening because I imagine Don Cheadle and Gweneth Paltrow would want similar pay raises. I personally didn't mind IM2 or 3, but I agree the first was the best and wouldn't mind a IV. What about The Watcher & Galactus(Kirby style )? 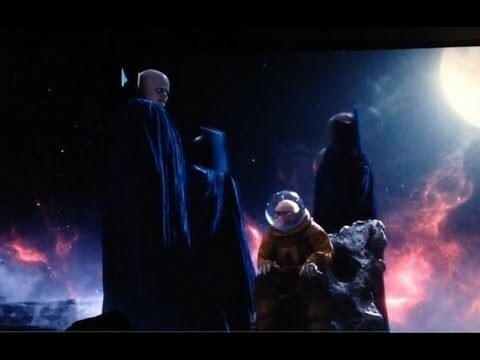 I don't think the Watcher would translate well to the silver screen, I mean, what would he do, watch? Ultimately, he'd just be taking up valuable screen time. With as much as these movies have going on, that's a no-no! Now Galactus is a totally different discussion! I hope they can bribe Cap to stick around. Steve Rogers is a great character. Maybe patriotism ain't what it used to be. Would be a shame to kill him off. And I dont want no Bucky taking his place. Steve Rogers or nothing. Luke The Drifter and alexpop like this. And get rid of the guilt beard, Cap. What about The Fantastic Four, my favorite Marvel comic in the sixties. Yet to be given a good movie yet ? Ok! Silver Surfer one had its moments, Dr. Doom was rubbish. Best part Surfer/Torch chase. Marvel has so many characters they can rotate them around, temporarily kill them or have them go missing or whatever and eventually when there is another story to be told, they can recast. Now that DC/Marvel owns Fox, they have access to the entire Fantastic Four and X-Men universe, which will give them another dozen movies to do over the next 5-6 years. Although Kevin Feige has said their plan is to have more "woman-oriented" films, similar to Wonder Woman and the upcoming Captain Marvel, and also provide more diverse casts and filmmakers. True...but I think at the very least Steve Rogers is taken off the board for awhile and death, even if temporary, would be a way to go. Wait 7 or so years and bring Steve back with a new actor in the role. Hell a few years back they had Steve die for awhile and put Bucky into the Captain America mantle for a couple years, and briefly they had a story where Steve was forced to retire and Falcon became Cap. I see either happening. I really hope he is allowed to be Cap in Part 4, and back in the red, white and blue. Simon A, superstar19, alexpop and 2 others like this. Vidiot, alexpop and dkmonroe like this. And if killed off, there's still a Captain, ....Marvel, not quite the same. Why was he all in black? Even the shield was gone in favor of awkward black wrist guards. I never saw Black Panther, so I figure that may have clued me in about the change, but it was quite obnoxious. With the beard and wetsuit, I barely recognized him. He looked more like a random surfer dude than Captain America. He's lost his mojo after the bucky/iron man ( parents killed off) guilt trip hence losing his righteous identity, went over to the dark/morbid side ..but still Captain with morals. He didn't "lose his mojo", he just abandoned the Captain America identity after Tony demanded he give him back the shield in Civil War. Tony's position was that if you stand by the guy that killed my dad, you don't have any right to keep the shield he gave you. Steve Rogers, not willing to stop seeking redemption for Bucky, and realizing that he was who he was even without the shield, said, "okey dokey' and left Tony the shield. And having left the shield, and also being a renegade wanted by the U.N. and pursued by Thunderbolt Ross, he decided to stop being Captain America altogether, as the image would be somewhat incongruous for a guy on the run for violating an international treaty and freeing superpowered prisoners accused of international terrorism. But he's still got a star on his chest, so he's not made a complete break with the past. He got the weird wrist-shield things from Black Panther - he appears with them after BP says, "Get this man a shield." He's not gone dark or morbid, he's the same guy with a much less spangly suit, and a more complicated relationship with the other Avengers and the U.S. government. His appearance in Infinity War is one of the greatest moments in the movie, rivaled only by Groot's gracious gift of an arm to make Thor a magical battle-axe. Frankly, I wonder if the whole Fantastic Four thing is just too long in the tooth to be made into a credible story today. They've tried it twice now and both attempts have been pretty lousy - I saw the first movie and it was the worst superhero movie I'd ever seen. The Silver Surfer sequel was pretty much a flop and the reboot attempt was DOA. The last couple of Spiderman movies didn't do great, either, but then Disney took over creative control, recast, and it became a hit all over again. You have to wonder if maybe Marvel could do the same kind of magic again. dkmonroe, F_C_FRANKLIN, Luke The Drifter and 1 other person like this. Iron Man gave him Spider legs as a option in Infinity ( still meh). Fantastic 4 don't have quite the same super powers as say Thor..ironically The Thing in the silver age silver sixties Marvel comic was really strong + super funny. Not as strong as Hulk though, they had a battle in one of the comics, Hulk won. At least Disney should introduce the highly philosophical moral Silver Surfer, when he's not working for Galactus that is. I watched it over the weekend. Entertaining, but a little too ‘Lord of the Rings’ in parts, especially the Zealand’s battle when the never-ending supply of whatever those creatures were put me in mind of those overblown LOTR battles with a zillion CGI orcs filling the screen. Thanos is a cracking comic-book villain. Watched it 4 times now. It moves along real fast. Best Marvel film? Has to be up there. I believe the Russos said that Cap’s storyline was pulling from the Nomad persona of the comic books. His disillusionment started in Winter Soldier, and I am hoping is complete now. Maybe he will realize with 1/2 the population wiped out, that the world will need a symbol of hope. Plus, in Spider-Man: Homecoming Happy mentioned moving “Cap’s new shield”. So apparently Tony has made some upgrades for him. Also, under Cap’s Infinity War outfit there was vibranium scales peaking out, which also hailed from a look from later comics. One thing that made no sense to me, was Black Panther giving him a suit that 1. Had no head protection 2. Had arm shields that he could not throw, which is normally Cap’s main offensive weapon. It’s time to be Captain America again. Simon A, dkmonroe, F_C_FRANKLIN and 2 others like this. But the first three Spider-man movies were resounding successes, so at least they had something to build on. I think the first FF movie didn't do poorly but I don't think it was the smash that the first Spider-man movie was. I remember the Nomad story and this is really only peripherally related. First think that Steve Rogers did as Nomad was trip on his cape and (IIRC) get the crap beat out of him by the first villain he fought. That was a real "lost mojo" story. The good thing is they don't need to force that and annoy fans by changing things as the comics from Giant Size X-Men on were ahead of their time in being diverse/normal - that comic has a German, Russian, Black African woman, Asian and a Native American, and from them on it was always pretty diverse with strong female characters. I think we are a little spoilt and take what Marvel have done for granted. If they had said 10 years ago we would have a film where Spider-Man goes into space, Thor teams up with a talking Racoon and a talking tree and we would visit a whole load of strange worlds and it all works seamlessly and in a completely believable way I think even hard-core fans would have thought that would be more than they could ever achieve. Simon A and superstar19 like this.